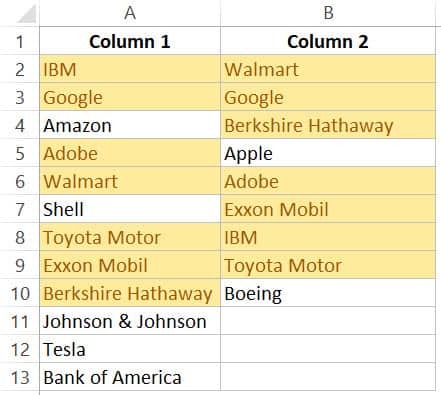 The one query that I get a lot is – ‘how to compare two columns in Excel?’. This can be done in many different ways, and the method to use will depend on the data structure and what the user wants from it. For example, you may want to compare two columns and find or highlight all the matching data points (that are in both the columns), or only the differences (where a data point is in one column and not in the other), etc. Since I get asked about this so much, I decided to write this massive tutorial with an intent to cover most (if not all) possible scenarios. 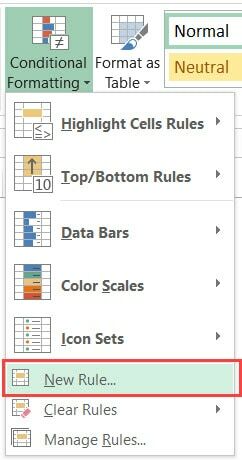 If you find this useful, do pass it on to other Excel users. Note that the techniques to compare columns shown in this tutorial are not the only ones. Based on your dataset, you may need to change or adjust the method. However, the basic principles would remain the same. This one is the simplest form of comparison. In this case, you need to do a row by row comparison and identify which rows have the same data and which ones does not. Below is a data set where I need to check whether the name in column A is the same in column B or not. If there is a match, I need the result as “TRUE”, and if doesn’t match, then I need the result as “FALSE”. 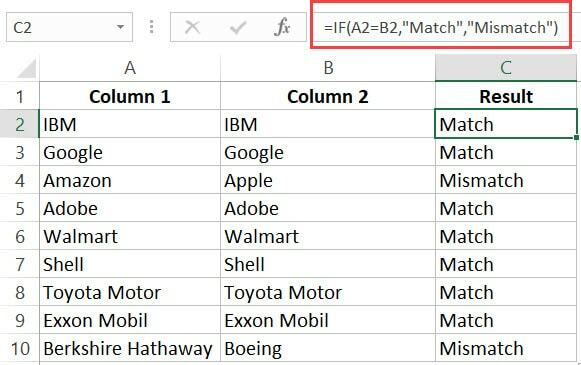 If you want to get a more descriptive result, you can use a simple IF formula to return “Match” when the names are the same and “Mismatch” when the names are different. With the above formula, ‘IBM’ and ‘ibm’ would be considered two different names and the above formula would return ‘Mismatch’. If you want to highlight the rows that have matching data (instead of getting the result in a separate column), you can do that by using Conditional Formatting. In the Styles group, click on the ‘Conditional Formatting’ option. From the drop-down, click on ‘New Rule’. 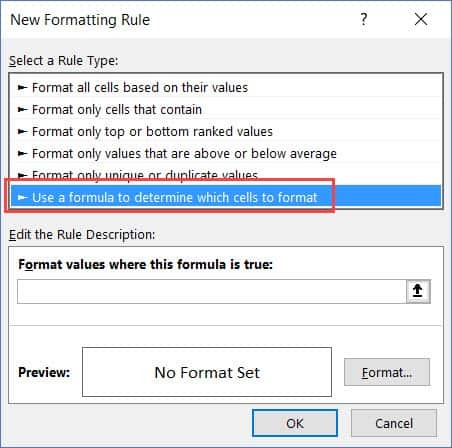 In the ‘New Formatting Rule’ dialog box, click on the ‘Use a formula to determine which cells to format’. 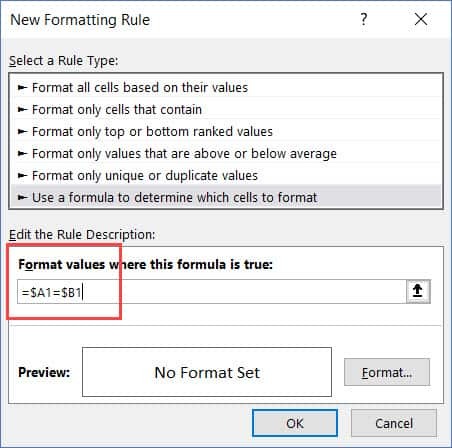 Click the Format button and specify the format you want to apply to the matching cells. This will highlight all the cells where the names are the same in each row. 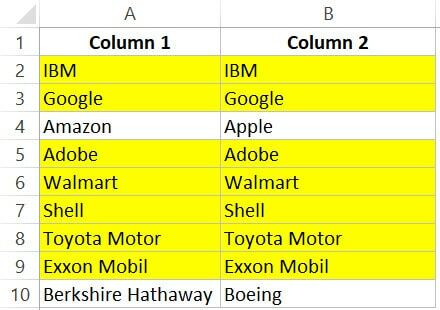 If you want to compare two columns and highlight matching data, you can use the duplicate functionality in conditional formatting. Note that this is different than what we have seen when comparing each row. In this case, we will not be doing a row by row comparison. Often, you’ll get datasets where there are matches, but these may not be in the same row. Note that the list in column A is bigger than the one in B. 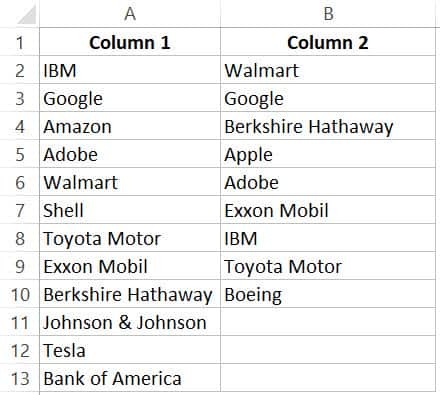 Also some names are there in both the lists, but not in the same row (such as IBM, Adobe, Walmart). 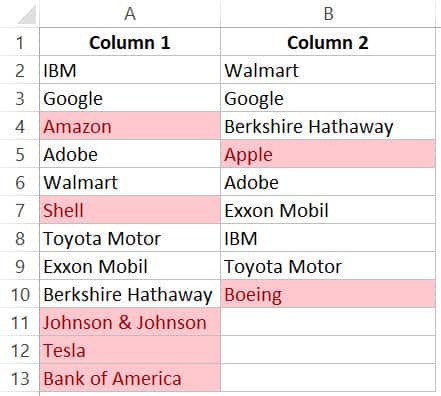 If you want to highlight all the matching company names, you can do that using conditional formatting. Hover the cursor on the Highlight Cell Rules option. In the Duplicate Values dialog box, make sure ‘Duplicate’ is selected. The above steps would give you the result as shown below. 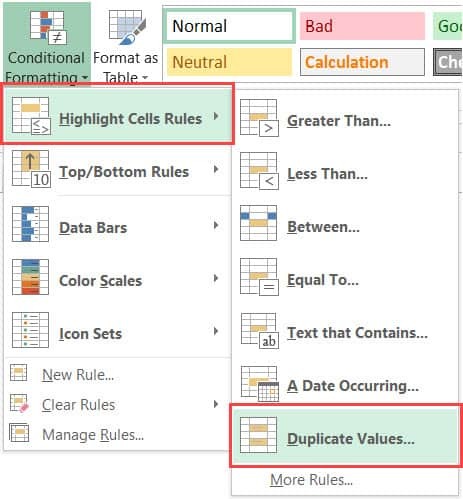 Note: Conditional Formatting duplicate rule is not case sensitive. So ‘Apple’ and ‘apple’ are considered the same and would be highlighted as duplicates. 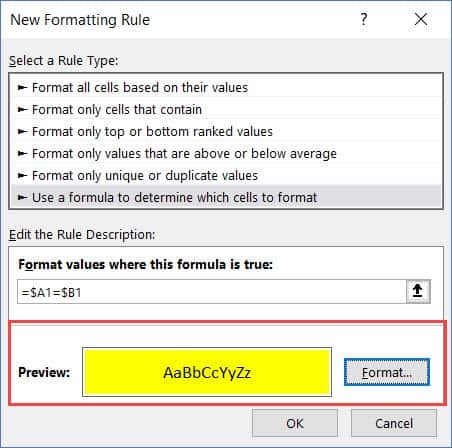 In case you want to highlight the names which are present in one list and not the other, you can use the conditional formatting for this too. In the Duplicate Values dialog box, make sure ‘Unique’ is selected. This will give you the result as shown below. It highlights all the cells that have a name that is not present on the other list. If you want to identify whether a data point from one list is present in the other list, you need to use the lookup formulas. To do this, I can use the following VLOOKUP formula. 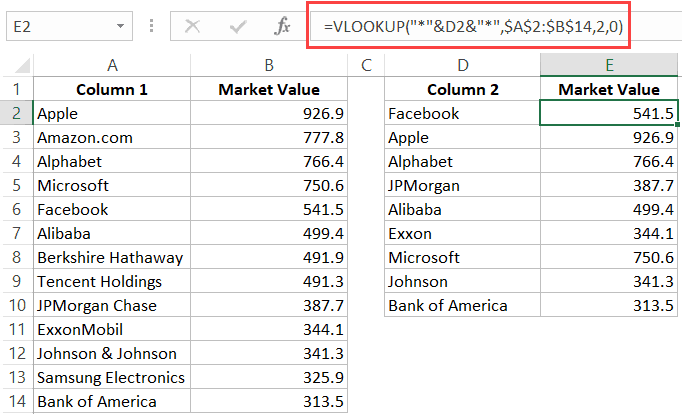 This formula uses the VLOOKUP function to check whether a company name in A is present in column B or not. 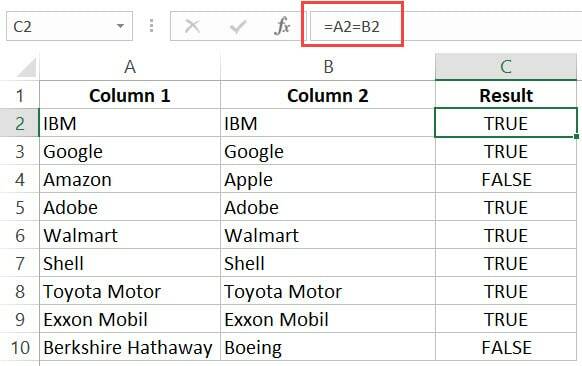 If it is present, it will return that name from column B, else it will return a #N/A error. 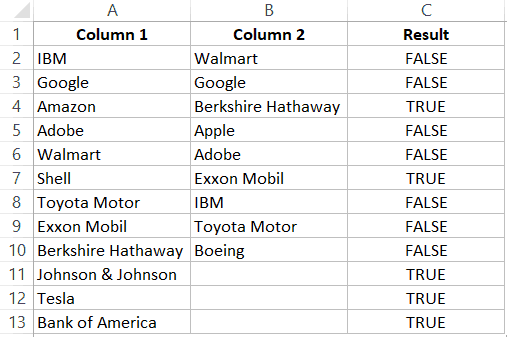 These names which return the #N/A error are the ones that are missing in Column B.
ISERROR function would return TRUE if there is the VLOOKUP result is an error and FALSE if it isn’t an error. If you want to get a list of all the names where there is no match, you can filter the result column to get all cells with TRUE. Note: Personally, I prefer using the Match function (or the combination of Index/Match) instead of VLOOKUP. I find it more flexible and powerful. 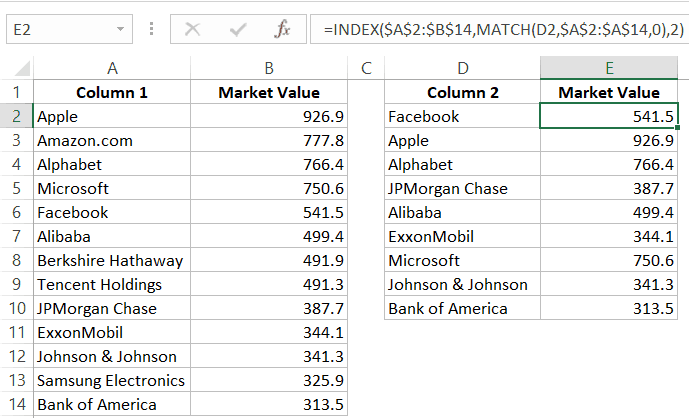 You can read the difference between Vlookup and Index/Match here. If you have two datasets and you want to compare items in one list to the other and fetch the matching data point, you need to use the lookup formulas. 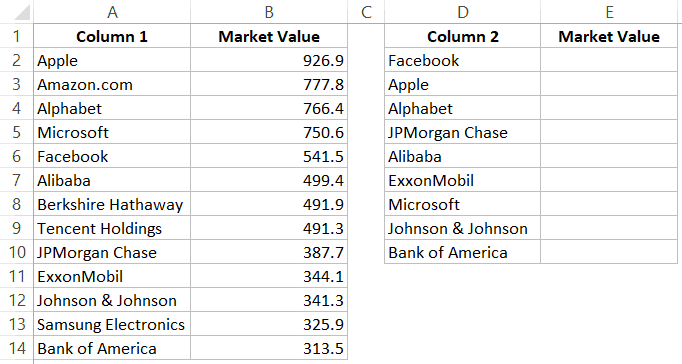 For example, in the below list, I want to fetch the market valuation value for column 2. 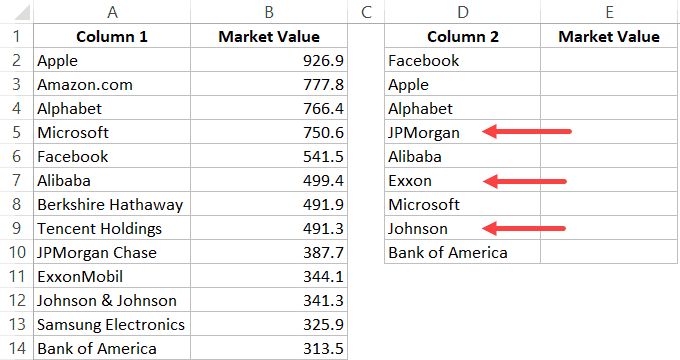 To do this, I need to look up that value in column 1 and then fetch the corresponding market valuation value. In case you get a dataset where there is a minor difference in the names in the two columns, using the above-shown lookup formulas is not going to work. These lookup formulas need an exact match to give the right result. There is an approximate match option in VLOOKUP or MATCH function, but that can’t be used here. Suppose you have the data set as shown below. Note that there are names that are not complete in Column 2 (such as JPMorgan instead of JPMorgan Chase and Exxon instead of ExxonMobil). In such a case, you can use a partial lookup by using wildcard characters. In the above example, asterisk (*) is a wildcard character that can represent any number of characters. When the lookup value is flanked with it on both sides, any value in Column 1 which contains the lookup value in Column 2 would be considered as a match. For example, *Exxon* would be a match for ExxonMobil (as * can represent any number of characters). Excel Advanced Filter: A Complete Guide with Examples. I need help comparing two columns for duplicates and unique values. I know I can do this using conditional formatting however my issue is that for example in column 1 I have duplicates so when I apply the conditional formatting it is picking the duplicates up in the same column however I only want to pick up the duplicates against the two columns. E.g. When I apply the conditional formatting it picks up Red as a duplicate as it appears twice in column one but only want to find duplicates comparing the two columns so I would like it to pick up: Yellow and Green. I need help on how to compare everyday Item that we’re sold. Then I need to put the comparison price list. How do I check if Price was already there so I do not have to do it again? thanks a lot for your support which has given me great support in my work and please share the formulas to pullout the duplicates separate from the data. Like you read my mind and know that this is what I am already searching for. 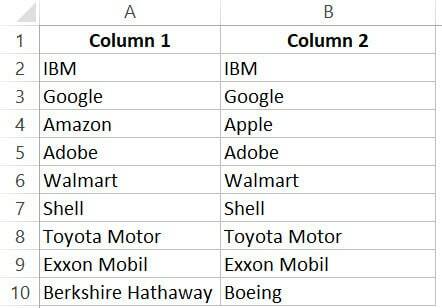 Very useful to solve two columns comparison..
Usefull Excell tips for me. Very Use full Excel Trick. Glad you found the tutorial useful Virendra! very useful, thank you Sumit. If you can assist on another similar case. I need to use conditional formation where, if I want to compare two numbers and use colour to identify the difference, be it positive or negative. For an example: If value is cell A is lower than a value in cell B, then highlight be in Red, otherwise highlight cell B in green. I need to use this to highlight variances in sales targets vs actual sales on different product lines.